We stumbled upon each other at the Annapolis Boat Show in 2015… we got engaged that next year and sailed from Michigan to England double-handed as our pre-martial test. From my house to his house. We passed. Got married. Currently living in-between Michigan, and “wherever the boat is”. Just like many of you, we are trying to answer the same question. Is life afloat sustainable? London born. Raised between New Zeeland and the south coast of England. 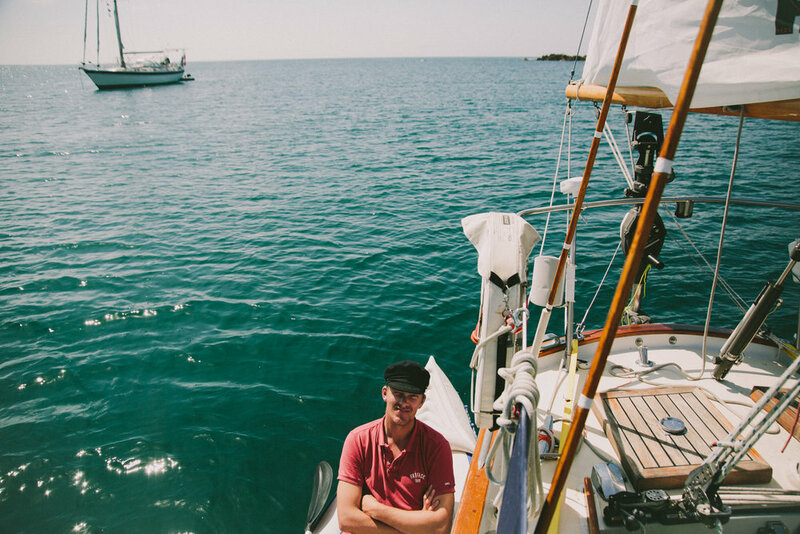 Luke began sailing when he was 11 and has been in the boat building and marine industry every since. He taught sailing in Spain. Built wooden boats in Australia. Sold sailing hardware and sails all over the world. His personal and professional life always revolved around the sea. An accomplished dinghy racer, and multi-hull sailor, he holds a speed record for sailing a Hobie Cat around Great Britain double-handed. Having have sailed tens of thousands of miles by the age of 34, he’s an admirable seaman. He dreams to sail across the Atlantic in a 16 ft Wayfarer. SO WHO IS HE AT SEA ? Michigan born. Explored California and Colorado in her younger years, until buying her first boat at 23 and deciding to travel America’s waterways known as “The Great Loop”. This ultimately changed the course of her life. For the past three years she has been working as a professional photographer in Michigan, or anywhere the work takes her. To explore her professional work - please visit J . ZEVALKINK PHOTO. She specializes in weddings, portraits and families. On the side she is a freelance writer and story teller, actively contributing to Cruising Outpost magazine. Hustling from June-Oct as an independent contractor, she has been able to spend her winters sailing and traveling, and like the rest of us - budgeting. She dreams of having the ability to be in two places at once. SO WHO IS SHE AT SEA ? writer / photographer / introvert / she-captain / diesel mechanic / electrician / cleaning lady / varnisher / inventory chief / docker / cloud studier / quick to reef / cruiser / seasick / conservative / despises night watch.